Antique mantle clocks come in various shapes and sizes, and were made for a flat surface. Mantle clocks have a clock face, sometimes encased in glass, but often times exposed. Throughout the years, the outside of the clock around the face can get dirty, and the inside mechanisms may need to be cleaned and repaired. Some minor adjustments to an antique clock will keep it running smoothly for many years. Turn the mantle clock around, and open up the back. Examine the gears, bushings and pivots. Check to see if the movement and other parts are working efficiently. If not, purchase cleaning solution from a clock supply store. Dismantle the movement and clean it using the clock cleaning solution and a small bristle brush. Polish the pivots with a dry cloth. Clean the grime between the pivot and the hole of the plate on the movement with the brush. Remove old oil from the gears with the brush and use clock oil to re-lubricate. Apply a few small drops at a time. Make sure the mainspring or suspension spring is functioning. These springs are what make the movement and other parts of an antique mantle clock work properly. Replace a spring if broken. After replacing, check to see that the movement is restored. Make sure that the movement is aligned into the proper grooves within the clock when readjusted. If the spring is repaired, then the movement will function efficiently. Do not move the clock once the pendulum bob is attached in its proper position. According to member Dave Coatsworth of The National Association of Watch and Clock Collectors Inc., attempting to move a clock with the pendulum bob attached could damage the suspension spring. Unhook the pendulum, clean the pendulum hook, and re-attach the pendulum back into place, with the shiny part of the pendulum facing front. Open up the front of the glass clock face, and check the hands to make sure they move freely. Do not turn the hands quickly past the numerals, for this may throw off the striking time. Take a different soft cloth, and gently wipe in-between the hands at each numeral interval, to clean the clock face. As this is done, wait for the clock to strike at every numeral. Don’t move the hands counterclockwise past the 6 or 12. This will throw off the sequence, and possibly disrupt the strike. Adjust the dowel by pushing on it. The dowel is located in the middle part of the hands. Pushing on it will regulate the hand speed from slow to fast, and keep the inner workings of an antique mantle clock from wearing out. 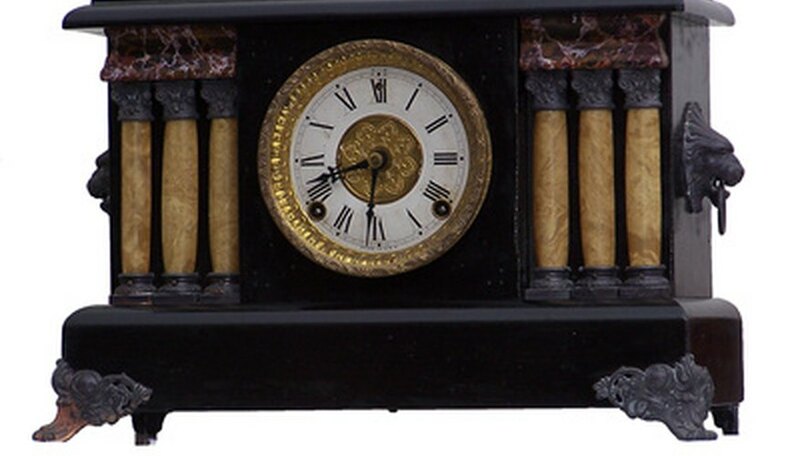 Take the antique mantle clock to a professional if you cannot repair or clean the clock. Improper care and handling as well as the wrong lubricant can result in damage to your antique clock.